Hay fever accounts for an enormous number of missed days at work each year. Those who do manage to make it to work often find that their work quality suffers and they feel miserable stuffed up and congested as they struggle to get through the day. If you deal with the public on a regular basis, you may also face embarrassment and social nervousness from bloodshot eyes, itching, sneezing and irritated skin from constantly blowing your nose. Fortunately, there are ways to address hay fever symptoms, thereby reducing lost days at work and allowing you to successfully function in the workplace. For hay fever sufferers, prevention will be a lifestyle. By getting into a routine of monitoring pollen counts and keeping your home dust and pollen free through frequent vacuuming and washing, you can reduce exposure to your allergens. This means a reduced frequency and intensity of hay fever symptoms and a better day at work. At the office, be prepared to go outside of your job duties and dust on occasion if the regular cleaning performed by maintenance employees isn't keeping your work area clean enough. It will only take a few minutes to wipe down the area but the reduction in hay fever symptoms can be significant. It's important to always keep hay fever medications handy at work. If this means keeping medications in your desk drawer, then make sure you keep an ample supply. The last thing you need is to run out of your nasal spray just before a big meeting. Whether you are taking a decongestant, antihistamine, anti-inflammatory drug or another hay fever medication, always ensure you have a steady supply at work or in your handbag or briefcase. If you do lose time off work due to hay fever symptoms, try to work from home if possible. You'll reduce your workload when you return and your boss and colleagues will appreciate your concern and tenacity to complete work, despite needing a day or two at home. You may feel less anxious working from home as well, because you won't have the social anxiety that can accompany the redness and other visual signs of hay fever. If you find that prevention and medication is not enough and you are frequently missing days from work due to severe hay fever symptoms, you should speak with your doctor again about other treatment options. Strategies such as immunotherapy may be of benefit. Last, but not least, it can really be helpful to share your health struggles with your boss and colleagues. To many people, hay fever is brushed off as minor and isn't taken seriously. If your boss and colleagues understand your challenges in treating hay fever and see your dedication to improving your health and maintaining a strong attendance at work, they may be more empathic to your allergies. Given that most of us spend a great deal of time at work, hay fever symptoms can really impact attendance and work quality. 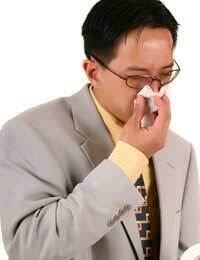 Hay fever symptoms can also leave sufferers dreading going to work each morning and fearing the reactions of colleagues, their boss or clients. Hay fever is not a condition to be taken lightly; with a little effort and attention to prevention as well as treatment with medications when needed, you can get back to being productive, comfortable and successful at work.